There are many ways us humans honour the dead but perhaps one of the strangest ways is the Taiwanese custom of Funeral Strippers. Scantily clad young women in high heels provocatively gyrating round poles to blaring music might not be what you expect at a Western funeral but in Taiwan it’s a common sight. One Taiwanese politician’s funeral featured 50 pole dancers. Tung Hsiang’s death was celebrated with strippers gyrating oo poles fixed on the roofs of jeeps. His family said it was their way of honouring him as he loved “having a lively fun time”. The Tawianese funeral procession of politician Tung Hsiang. In Taiwan respect for the dead is measured in crowd size , expense and decibels. Processions have always been a part of Taiwanese life and its not uncommon to see marching bands and gaily decorated funeral floats with exotic dancers. This freaky funeral custom is also practiced in China. mainly in rural communities. In China the hiring of funeral exotic dancers is a way for a family to show off their money. “Chinese rural households are more inclined to show off their disposable incomes by paying out several times their annual income for actors, singers, comedians and strippers to comfort the bereaved and entertain the mourners,” says the Global Times. But the Chinese authorities have tried to clampdown on the practice. In 2006, in the eastern province of Jiangsu, the leaders of five striptease troupes that perfoend at a farmers’ fuberal were detaiked by the authorities. 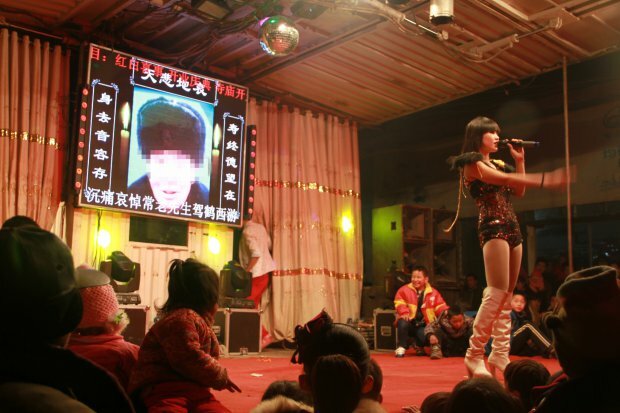 In 2015, organisers and performers of “obscene performances” at funerals in villages in Hebei and Jiangsu province were punished. And In a document released in January 2018, China’s Ministry of Culture reiterated their desire to crack down on funeral stripteases. They said the practice is “uncivilised” and have announced that anyone who hires a stripper to entice people to a funeral will be “severely punished”.